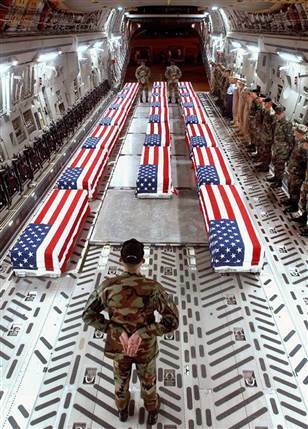 At least 4,155 members of the U.S. military have died in the Iraq war since it began in March 2003, according to an Associated Press count. The figure includes eight military civilians killed in action. At least 3,375 died as a result of hostile action, according to the military‘s numbers. The AP count is the same as the Defense Department’s tally, last updated Monday at 10 a.m. EDT. _ Army Pvt. Jordan P. Thibeault, 22, South Jordan, Utah; died Friday at Forward Operating Base Hammer of injuries from a non-combat incident; assigned to the 1st Battalion, 6th Infantry Regiment, 2nd Brigade Combat Team, 1st Armored Division, Baumholder, Germany. _ Two Army soldiers died Thursday in Baghdad after their vehicle struck an explosive. They were identified as Sgt. Kenneth W. Mayne, 29, Fort Benning, Ga., and Pfc. Bryan R. Thomas, 22, Battle Creek, Mich. Both were assigned to the 1st Battalion, 66th Armor Regiment, 1st Brigade Combat Team, 4th Infantry Division, Fort Hood, Texas.